Dr. Jim Affleck delivered several thousand babies during his three-decade career, but he never expected one of them would help extend his own life 45 years later. 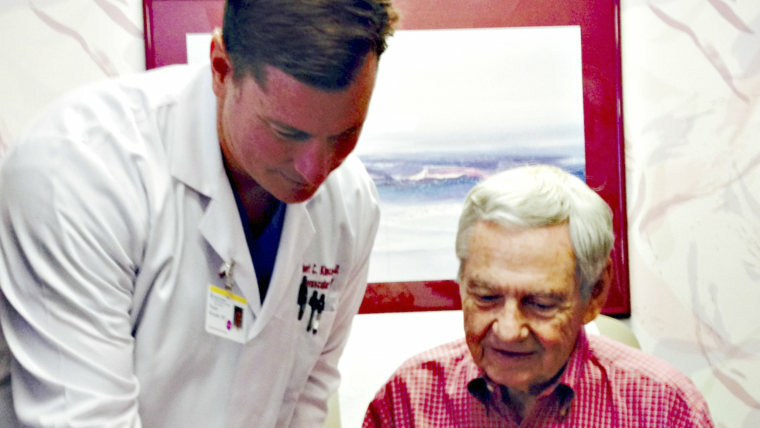 The 83-year-old retired obstetrician has a history of cardiovascular problems, and after experiencing shortness of breath, learned he needed a new aortic valve. Without the operation, he would only have 1-2 more years left to live. Today, however. he's much improved. "I am feeling great!" Dr. Affleck told TODAY.com. "Energy is up and (I am) breathing well." He had the procedure at Sutter Memorial Hospital in Sacramento. One of the doctors was Robert Kincade, a baby he delivered back on July 7, 1969. "I couldn't believe it!" Dr. Kincade told TODAY.com. "It's an honor to help him out." The 45-year-old doctor knew about Affleck's long career at the same hospital where he was born. He wondered whether Dr. Affleck could have been the one who delivered him. "I asked my mom and she said his name, so I knew it was him." Kincade told TODAY.com. He checked his birth certificate and Affleck's name was right there. Now what started at Sutter Memorial Hospital years ago has come full circle. "He can look forward to many years of quality life with his wife," Kincade said.